By 2030, Sustainable Developmental Goal 6 (SDG 6) aims to achieve universal and equitable access to safe and affordable drinking water for all. A safely managed drinking water service is defined as one located on premises, available when needed and free from contamination. 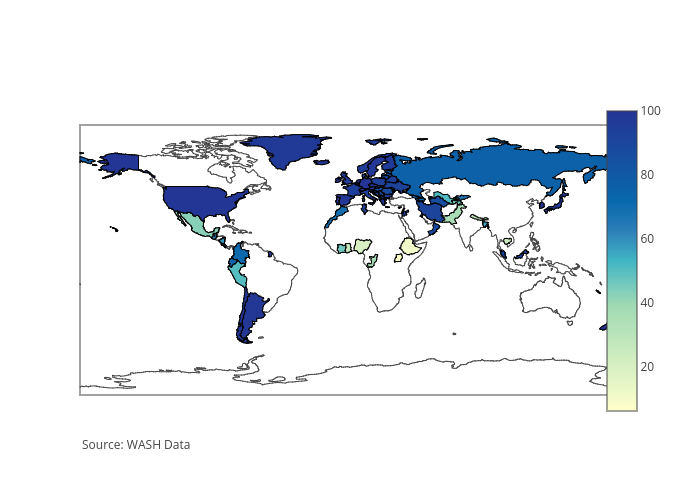 In 2015, Cyprus (99.6%), Malaysia (92.1%), New Zealand (100%) and United Kingdom (95.7%) had a greater proportion of their population using safely managed drinking water than the world average of 71%. However, in Uganda, only 6% of the population has access to safely managed drinking water. Note: Countries have been chosen based on availability of data. Sustainable Developmental Goal 6 (SDG 6) aims to ensure availability and sustainable management of water and sanitation for all. People practising open defecation refers to the percentage of the population defecating in the open, such as in fields, forest, bushes, open bodies of water, on beaches, in other open spaces or disposed of with solid waste. Over the five years, the open defecation rate has gone down for most Commonwealth countries in Africa except for Mauritius, Nigeria and Tanzania which witnessed an increase of 0.11%, 0.04% and 0.04% respectively. The percentage decrease from 2010 to 2015 was highest for The Gambia, which witnessed a 0.71% decrease in the open defecation rate while the decrease was the lowest for Cameroon at 0.02%. By 2015, Seychelles had no section of its population practising open defecation.